Samarkand contributed in particular to the progress of science in astronomy through its observatory. Some of its directors and their achievements are highlighted here. At the time that al-Kashi was growing up Timur was devastating large regions in the Muslim land, having proclaimed himself sovereign and restorer of the Mongol empire at Samarkand in 1370. While Timur was undertaking his military campaigns, conditions were very difficult with widespread poverty; al-Kashi himself lived in poverty, like so many others at this time. He devoted himself to astronomy and mathematics while moving from town to town. Conditions improved markedly when Shah Rokh took over after his father's Timur death. He brought economic prosperity to the region and strongly supported artistic and intellectual life. With the changing atmosphere, al-Kashi's life also improved markedly. The first event in al-Kashi's life which we can date accurately is his observation of an eclipse of the moon which he made in Kashan on 2 June 1406 as we know from his Khaqani zij. On 1 March 1407 he completed his treatise Sullam Al-sama (The Stairway of Heaven, on Resolution of Difficulties Met by Predecessors in the Determination of Distances and Sizes (of the heavenly bodies). Years later, his Mukhtasar dar ilm-i-hayat (Compendium of the Science of Astronomy) written during 1410-11 was dedicated to Sultan Iskander as is indicated in the copy in the British museum. In 1413-14 Al-Kashi finished his Khaqani zij, which he dedicated to Uluh Beg, stating in his introduction how he was working on astronomical problems for a long time whilst living in extreme poverty and that he would not have been able to finish his zij without Uluh Beg's support. In this work there are trigonometric tables giving values of the sine function to four sexagesimal digits for each degree of argument with differences to be added for each minute. There are also tables which give transformations between different coordinate systems on the celestial sphere, in particular allowing ecliptic coordinates to be transformed into equatorial coordinates. The Khaqani Zij also contains detailed tables of the longitudinal motion of the sun, the moon, and the planets. Al-Kashi also gives the tables of the longitudinal and latitudinal parallaxes for certain geographical latitudes, tables of eclipses, and tables of the visibility of the moon. Al-Kashi was working as a physician to supplement his income until he was secured a permanent livelihood by Uluh Beg. Uluh beg, then, was seeking best scientists to help with his scientific projects. Uluh Beg invited Al-Kashi to join him at this school of learning in Samarkand, as well as around sixty other scientists including Qadi Zada. In his letters to his father, Al-Kashi praises the mathematical abilities of Uluh Beg, most particularly his ability to perform difficult mental computations; he described the prince's scientific activity and called him director of the observatory. Despite Al-Kashi's ignorance of the correct court behaviour and lack of polished manners, he was highly respected by Uluh Beg. Al-Kashi also gives in his letters interesting information on the construction of the observatory building and its instruments. Because of its high quality, this work was frequently copied, and served as a manual for hundreds of years. Dold-Samplonius has discussed several aspects of al-Kashi's Key to Arithmetic. For example the measurement of the muqarnas refers to a type of decoration used to hide the edges and joints in buildings such as mosques and palaces. The decoration resembles a stalactite and consists of three-dimensional polygons, some with plane surfaces, and some with curved surfaces. Al-Kashi uses decimal fractions in calculating the total surface area of types of muqarnas. The qubba is the dome of a funerary monument for a famous person. Al-Kashi finds good methods to approximate the surface area and the volume of the shell forming the dome of the qubba. Al-Kashi's great mathematical achievements are also Risala al-muhitiyya and Risala al-watar wa'l jaib; both written in direct connection with astronomical researches and especially in connection with the increased demands for more precise trigonometric tables. When he died, in 1436, Al-Kashi was very much mourned, not least by Uluh Beg. Qadi Zada al-Rumi (or more properly Salah Al-Din Musa pasha) (Born: 1364 in Bursa, Turkey; Died: 1440 C.E. in Samarkand, Uzbekistan). Montucla, in his history of mathematics holds that he was a Greek convert to Islam which Dilgan suggests may come from a misunderstanding of the name al-Rumi, as the peoples who lived in Asia Minor were called Rum, meaning Roman (not Greek), because Asia Minor was once Roman.Qadi Zada means "son of the judge" and we must assume that indeed Qadi Zada's father was the judge. It was in his home town of Bursa that Qadi Zada was brought up, and completed his standard education and then studied geometry and astronomy with the theologian-encyclopaedist al-Fanari (1350-1431). His teacher al-Fanari realised that Qadi Zada was a young man with great abilities in mathematics and astronomy and he advised him to visit the cultural centres of the empire, Khorasan or Transoxania, where he could benefit from coming into contact with the top mathematicians of his time. He also gave him letters of recommendation and one of his works: Emmuzeg al-ulum (Types of sciences) to present to the scholars of those parts. Following this, Qadi Zada studied Mathematics and astronomy in Transoxiana; then a great cultural centre. In 1383, already, Qadi Zada gained a great reputation as a mathematician by completing a treatise on arithmetic: Risala fi'l Hisab; a work which covers arithmetic, algebra and mensuration. After visiting a number of cities, Qadi Zada reached Samarkand in about 1410. Uluh Beg was only 17 years old when Qadi Zada met him at Samarkand in that year 1410. He was far more interested in science and culture than in politics or military conquest but he was, nevertheless, deputy ruler of the whole empire and, in particular, sole ruler of the Mawaraunnahr region. Qadi Zada had frequently Uluh Beg as a student at his classes. Meeting Uluh Beg was certainly a turning point for Qadi Zada, for he would spend the rest of his life working in Samarkand. Qadi Zada wrote a number of commentaries on works on mathematics and astronomy during his first years in Samarkand, which seem to have been written for Uluh Beg and it would appear that Qadi Zada was producing material as a teacher of the brilliant young mathematician. One commentary on the compendium of the astronomer al-Jaghmini was written by Qadi Zada in 1412-13, while a second commentary was on a work by al-Samarkandi. In 1417, perhaps encouraged by Qadi Zada, Ulugh Beg began building a madrasa. The madrasa, fronting the Rigestan Square in Samarkand, was completed in 1420 and Uluh Beg then began to appoint the best scientists he could find to teaching positions in his university. There is little doubt that al-Kashi, Qadi Zada and Uluh Beg himself, were the leading astronomers and mathematicians at this prestigious establishment in Samarkand. 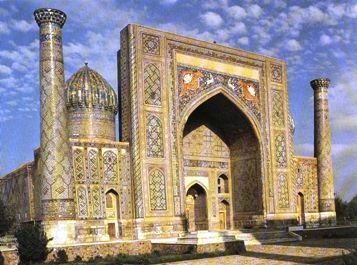 Construction of the Samarkand observatory began in 1424 and, while the observatory was under construction, al-Kashi wrote to his father, praising the mathematical abilities of Uluh Beg and Qadi Zada. Qadi Zada's most original work Risalat al jayb (Treatise on the Sine) was a computation of sines with remarkable accuracy. He published his methods in his treatise in the sine and, although al-Kashi also produced a method for solving this problem, the two methods are different and show that two remarkable scientists were both working on the same problems at Samarkand; Qadi Zada computed the sine of angles to an accuracy of 10-12 significant figures (if expressed in decimals), as did al-Kashi. After the death of al-Kashi, Qadi Zada became the director of the Samarkand observatory. The major work undertaken at the Observatory in Samarkand was the production of the catalogue of the stars, this star catalogue, the Zij-i Sultani, set the standard for such works up to the seventeenth century. Published in 1437, in the year following Qadi Zada's death, it gives the positions of 992 stars. The catalogue was a collaborative effort by a number of scientists working at the Observatory but the principal contributors were certainly Uluh Beg, al-Kashi, and Qadi Zada. In addition to tables of observations made at the Observatory the work contained calendar calculations and results in trigonometry.